The Bangkok International Motor Show is the ‘big one’ in the local arena, and in fact it is the biggest and most prestigious in SE Asia. With good support from the manufacturers, and many concept cars (and bikes) you can spend many happy hours there. I mentioned the ‘stars’ of the show last week, but they are worth repeating. At 20 million baht, the Bentley Continental GT is the fastest four seater in the world. At 70 million baht was the Mercedes-Benz SLR McLaren, the fastest production car in the world (334 kph) and at 80 million baht was the most expensive (and largest) car in the world, the Maybach 6.2. Of course there was another end of the market on show as well. The Wuling Scorpion is still the cheapest new vehicle at 275,000 baht. You get what you pay for, but it is possible to buy an new vehicle under 300,000 baht, and come away with change! 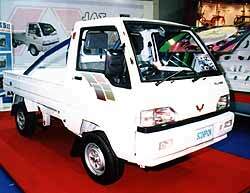 The government push on the Thai motor industry is moving away from pick-ups. After successfully making Thailand the pick-up hub for Asian production, they are now trying to get support for the ‘Eco Car’ concept. Small fuel efficient vehicles do just happen to make sense, especially on Bangkok’s choked roads, so something like the Japanese K-car regulations is likely. Mitsubishi had one on display that could fit immediately, even if the styling was a little ‘quirky’! A couple of weeks back, I suggested that the BMW stylist Chris Bangle had been moved to an ‘inactive post’ as they say in Thailand. Bangle is the man who everyone believes tacked on that ugly rear onto the 7 Series and now also the 5 Series. This auto backside was the reason that there was an on-line petition to get rid of him, the ‘new look’ being very unpopular. While at the Bangkok International Motor Show I suggested this scenario to some senior BMW people, but they denied this, saying that Bangle was promoted, and the Bangle bottom is here to stay. In fact, some sources in the USA (where BMW have their design studio) have even indicated that Adrian Van Hooydonk drew the 7 and 5 series cars under Bangle’s direction. So perhaps it wasn’t the Bangle bottom but the Hooydonk Hunkers? The official position is that the company has reorganized its design operation, appointing five separate designers as heads of ‘brand design studios’. New faces include Gert Volker Hilderbrand as head of MINI, Ian Cameron as head of Rolls-Royce, and Bangle prot้g้? Adrian van Hooydonk as boss for BMW cars. Bangle gets a new position - director of BMW Group Design. Countering this suggestion are other reports from the US trade press, claiming BMW approached a prominent designer last year to replace Bangle but he turned the offer down, calling the position ‘unworkable’. Another senior design source claimed this move was the only option, as sacking Bangle would have been an admission his approach was wrong. Spy shots of next year’s 3 series would appear to indicate that Bangle’s signature ideas have been toned down. A prediction! The Bangle Bottom won’t be on the next face-lifted (or should I say, bottom lifted) BMW’s. Now to say any motor car is a ‘bargain’ when its retail price in this country is around 20 million baht, sounds ludicrous, but read further. You have to compare like with like. This is a luxury motor car and has to be compared with other luxury motor vehicles. You have also to take into consideration that this is the fastest four seat production car in the world. I had a good look at the example at the Bangkok International Motor Show, thanks to Greg Pluegboonyachai, the general manager of Bentley Thailand, and it is simply stunning. Photographs do not do this car justice. In the metal it is breathtaking. Open the door and it is even better! The show car had a light tan leather upholstery and I joking suggested that it must have resulted in the slaughter of a herd of cows. “Only seven,” said Greg, with a straight face. Here are some brief specifications. Up front is the twin turbo, 6-litre, W12 engine developing 552 bhp and 650 Nm of torque. Maximum torque developed at just 1600rpm. That’s barely off idle revs! Top speed of 198mph (318 kph) and 0-100 km/h in 4.8 sec. Six speed, paddle operation automatic transmission with full lock-up and four-wheel drive with central Torsen differential, computer controlled air-sprung multi-link suspension front and rear and the largest brakes of any car ever put into production. Let’s look at some specifics, for the technically minded readers. The powerplant of the Continental GT is its 5998cc, four camshaft, 48-valve, twin turbocharged W12 engine. 552 bhp (411kW) at 6100rpm. Maximum torque is 650 Nm (479lb ft) which may sound impressive but what is doubly impressive is that it is generated at just 1600 rpm. This engine is a technological tour de force. It is physically the smallest 12 cylinder engine currently in production, despite its 6 litre displacement. This has been made possible by its ‘W’ formation where instead of arranging the cylinders in two long rows as you would in a conventional V12 configuration, each bank of cylinders is actually staggered, effectively creating two V6 engines on a common crankshaft. The angle between the two main banks is 72 degrees, and between the staggered cylinders just 15 degrees. The transmission is something special too. The ZF 6HP26 gearbox is the most advanced of its kind in the world, offering not only six ratios but also the ability to lock up its torque converter in every gear, effectively providing manual gear changes via either the gear lever or steering wheel paddles. To get all the grunt to the ground, the Bentley Continental GT has All Wheel Drive (AWD). The system used employs a central Torsen (TORque SENsing) differential and a free (open) differential for the front and the rear. Both the front and centre differentials have individual cooling radiators. The drive is split equally between the front and rear, giving a conventional 50:50 torque split, but is infinitely variable according to available grip and the Torsen differential, together with the 4 wheel sensors can detect slip of less than one percent and act accordingly, sending the engine’s torque to either the front or rear axle. This is a car of the future, as far as electronics is concerned. Consider these points: Each Continental GT contains approximately 3.2 km of cabling and the main wiring harness alone weighs over 50 kg. A Continental GT also contains 70 microprocessors (your computer has only one)! It has 35 individual control units - black boxes by another name - and they all talk to one another via three Control Area Networks (CAN) working at 500 kilobits/sec, and one superfast fibre-optic serial network operating at 4.2 megabits/sec. The computer buffs will understand more than I do. This electronic whizzbangery is important because all the various features on the car need to know what the others are up to as rarely does one have no impact on any of the others. For example, if the windows are being lowered, this is information that is likely to be of interest to the security systems. Another example is the information provided by the self-levelling sensors in the suspension is also of use to systems such as the electronics constantly monitoring the car’s progress and the automatic headlight levelling to keep the beam at a constant height. This car re-defines ‘Grand Touring’ and is certainly one car that I would love to own. It has almost everything I need. If you have a spare 20 million baht, give Greg Pluegboonyachai a call at 02 661 8800-1. If you buy one, tell me too and I’ll go you halves in the ‘spotters’ fee! Last week I asked who designed and built the 21 litre four cylinder engine for the Metallurgique? This should have been very easy. It was Wilhelm Maybach, father of the Maybach motor cars (and of Karl Maybach, who took the marque to fame). So to this week. Since I am dealing with Bentley this week, here’s a Bentley question. What has British Central Equitable Trust got to do with Bentley Motors?